Save the Date! If you want to be among the first to order the all new Massdrop Liquid Carbon X + SDAC DAC/Amp, Massdrop will be launching it on its maiden internet voyage on Thursday January 25 (exactly 11 months before Christmas) at 9am eastern time. The price will be $380 with free US shipping and subsidized international shipping. It will come with a 1-year Massdrop warranty. The shipping estimate will be revealed tomorrow after the listing goes live! This is an All-In-One design, with the DAC section by Grace Design and the Amp section by Alex Cavalli. The Borg approve of this 🙂 This is a single DAC/amp combo “all in one” unit. One of the pictures over there shows two pizza boxes stacked together ~ that may create unnecessarily confusion since it is not captioned to explain that the “Cavalli Tube Hybrid” is NOT included. The D30 supports up to DSD128 and 24/192 PCM and has three input options (USB, coaxial, optical) and RCA output. Power options are available in the shopping cart depending on location. It’s not an oolong tea, so please don’t steep it in hot water 🙂 The new condition Yulong DA9 Balanced DAC/Amp is now fully unlocked for $950 with free US shipping at the members-only but free-to-join Massdrop website. This runs for the next four days and change (from blog-posting time here) and will ship in early March 2018 from Massdrop. All sales final. There is no mention of warranty in the listing. Only 100 units are available but it is highly unlikely this will sell out considering the price. And now time for some used scavenger hunt action! We begin with the Audeze Deckard DAC/amp, it is available in “Used – Excellent Plus” condition for $414 plus shipping (starting at $11) at authorized dealer Adorama.com. When the used option sells out, you will no longer see it in their search results. If you like lots of connectivity options the new condition NuForce DAC80 is currently fully unlocked at the members-only but free to join Massdrop website for $250 with free shipping. It will ship in late February from Massdrop, all sales final. There is no mention of warranty in the listing. We have a lower used price for the Chord Mojo marble-button DAC/amp at Amazon Warehouse Deals. Marketplace seller “Audio Advice” is offering it for $399 with free shipping in “Used – Like New” condition. This ships directly from them and it is not Prime eligible. Running for the next four days and change (as of posting time here), you can get the new condition xDuoo TA-01 DAC/Amp for $120 with free US shipping at the members-only but free-to-join Massdrop. These will ship in late February 2018 from Massdrop, with all sales final. There is no mention of warranty in the listing. They take RCA and USB audio inputs, and output audio via RCA or a 1/4″ headphone jack. There is only one pair of RCA, its use depends on the audio situation (they are an input for the headphone-amp, and an output for the DAC). If you are tube-curious, there is one listing of the Bravo Audio V1 Tube Driven Headphone Amplifier in “Used – Good” condition (repackaged) offered for $43~ with free shipping, sold by Amazon Warehouse Deals actual. The new condition price there is $75+, so it’s a pretty decent used discount, considering AWD offers a 30-day return policy. The Fiio K5 DAC/amp with a docking station for select other Fiio products (eg select Fiio DAPs) is currently available in “Used – Very Good” condition (cosmetic imperfections; damaged original packaging) for $88 with free shipping by Amazon Warehouse Deals actual. The Audioquest DragonFly USB DAC/amp Version 1.2 is currently available in “Used – Like New” condition (original packaging) for $77~ with free shipping by Amazon Warehouse Deals actual. This is the ideal used option, “Like New”, and “original packaging” and Amazon Warehouse Deals actual (not marketplace sellers) being the seller of the product. Of course, as with all things used, there is always a YMMV/randomness component. As of the time of writing, the Amazon website shows that they have the new condition Magni 2 Headphone Amplifier available for $59 with free shipping, sold by Schiit Audio with the order fulfilled by Amazon, so Prime members get free 2-day shipping. Limit one per customer. The in-stock estimate is January 23, 2018. Sometimes the Amazon servers and stock availability may be slightly out of sync, so there is a bit of a YMMV in terms of availability. Amazon works in mysterious ways sometimes. Running for the next three days and change (from blog posting date), you can get the new condition Little Dot MK II Tube Headphone Amp for $130 with free USA shipping from the members-only but free to join shopping service that is Massdrop. You have options for different driver tubes that cost more than the base (included) ones. These will ship in mid-February from Massdrop, with all sales final. There is no mention of warranty in the listing. A $3 off clip-on coupon is running for a limited time at the Amazon listing of the YOHOOLYO XU09 portable headphone amp dropping its price from $27.99 to $24.99. Free shipping for Prime members or with a $25+ order (yes, the irony of the coupon discount taking away the free shipping). This is a headphone amp only, it takes 3.5mm input and outputs through the 3.5mm headphone out. The microUSB on the back is for charging the built-in battery. It has a volume dial, and a separate on/off power button, along with an LED light. It averages 3.9 out of 5 based on 41 customer reviews and has 14 answered questions. It’s back on the sale train again, the new condition RHA Dacamp L1 portable DAC/amp is down to the very specific price of $252.37 with free shipping at Amazon by Amazon actual with up to three sets per customer at the sale price. This is not a lightning deal, so expiration time/date is unknown. It only has four customer reviews, all of them happy with it. On the budget side of portable headphone amps, the Topping NX1s (it’s not plural, the “s” is part of the model name), is fully unlocked for $35 with free US shipping at the Massdrop website. It is running for the next two days and change (from blog posting time). It will ship mid-February 2018 from Massdrop, with all sales final, and no mention of warranty in the listing. It is available in either silver or black. It has 3.5mm audio input and output. The microUSB port is for charging only. 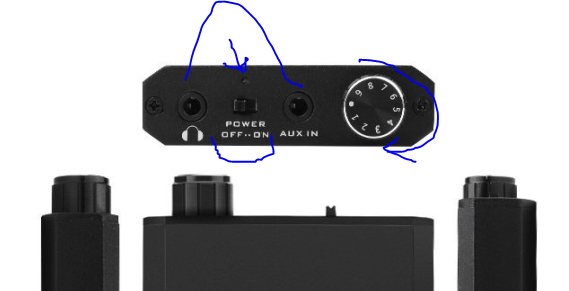 It has gain and bass physical switches (two settings each). They have a blanket 16 – 300 ohm recommended headphone impedance. PS: you can find our recent posts of Massdrop time-sensitive drops using the Massdrop blog tag (this link; bookmark it if you are interested in these type of posts specifically). The closed-back HD 820 headphones are the star of Sennheiser’s announcement and the subjects of a long wait until the early summer for release. Coming along with them, but already in-stock and shipping at various retailers is the HDV 820 DAC and headphone amplifier. Both have a price of $2400. The HDV 820 Headphone Amplifier is already in-stock and shipping by various at Amazon and B&H Photo and the official Sennheiser USA store and Hifi Heaven and World Wide Stereo, the last two being their eBay stores. If you are interested in the Denon DA-10 portable USB DAC/amp, you can get it in refurbished condition from authorized Denon dealer LISTENUP (of Colorado) through Amazon Warehouse Deals. This ships directly from ListenUp and it is not Prime eligible. It averages 4.6 out of 5 based on 13 customer reviews and has 10 answered questions. Fulfilled by Amazon seller “Amazing Deals Online” is offering the new condition Audioquest DragonFly Red USB DAC/Amp for the very specific price of $186.66 with free Prime shipping for members. This may be a price match or something, who knows. This is not a lightning deal, so expiration date is unknown. On the portable side of USB DAC/Amps, fully unlocked at Massdrop and running for the next five days and change (from blog-posting date) is the new condition NuForce uDAC-3 DAC/Amp Combo going for $60 with free US shipping. It ships in early February from Massdrop, with all sales final, and no mention of warranty in the listing. This takes USB audio input, and outputs analog (RCA) and digital (coaxial), along with a headphone output on the front. It is powered by USB, there is no separate power input. Since audio comes from USB as well, this can only be used with sources that output music via USB. We have a new low price for these at Amazon Warehouse Deals, it is the CHORD Mojo DAC/amp with the marble buttons in “Used – Very Good” condition for $439.50 with free shipping by Fat Wyre through Amazon. They ship directly from Fat Wyre but Prime members still get Prime-like shipping thanks to a lesser known Prime benefit. We mentioned earlier the iFi + Beyerdynamic combo, now we have a different iFi combo at BuyDIG! Using coupon code LISTENUP you can get the iFi Micro iDSD Black Label Headphone Amp with the HIFIMAN HE-400i Special Edition planar-magnatic over-ears for $549 with free shipping until 1/10/18 or earlier if sold out. Massdrop is back once again with another unlocked offer, running for one day and a few hours left (as of blog-posting date). It is the new condition NuForce BTR-100 Bluetooth Receiver going for $45 with free USA shipping. These will ship late January 2018 from Massdrop, with all sales final. There is no mention of warranty in the listing. The Massdrop party begins today with a series of offers that got unlocked during the last 24 hours or so. We start with one close to expiration, running for the next two days and change, the new condition Airist Audio Heron 5 Amplifier going for $600 plus shipping. Only 15 units are available for this drop. Five of them have been sold so far. These will ship in late January 2018 from Massdrop, with all sales final, and no mention of warranty in the listing. More action on the Massdrop front as more “drops” have “fully unlocked” (reached the lowest price of this particular Massdrop offer), including the new condition Topping MX3 Power/Headphone Amp w/ Bluetooth going for $100 with free US shipping. This offer is running for next day and change (from blog posting date) and will ship in early February by Massdrop. All sales are final. There is no mention of warranty in the listing. Ending at 5:15pm ET, an Amazon lightning is offering a 2pk of Merdumia Lightning to 3.5mm Headphone Jack Adapters for $6 with free shipping for Prime members or with a $25+ order. It averages 4.7 out of 5 based on 48 customer reviews. Massdrop again, running for one day and change (as of blog posting date) is the new condition Little Dot I+ Headphone Amp going for $90 with free shipping at Massdrop. In the shopping cart, there are also two options to upgrade tubes for +$13 or +$28. Tube Mania is a slippery slope 🙂 It will ship in early February 2018, with all sales final. There is no mention of warranty in the listing. It’s budget time! The new condition Pyle Phono Turntable Preamp is currently on sale for the very specific price of $12.76 in new condition at Amazon by Amazon actual with up to ten of them per customer. Free shipping with $25+ orders, or if you are a Prime member. It averages 4 out of 5 based on nearly 1000 customer reviews, and it has over 110 answered questions. It has RCA input (from turntable) and Line Level output to RCA. It also has a 1/4″ output (not sure if this is line level or headphone out). The new condition Pro-Ject Phono Box MM DC Phonograph Preamplifier goes for $79, but if you want to save some, you can get it in open-box condition as “Used – Very Good” at Amazon Warehouse Deals, sold and shipped by real world B&M A/V retailer HiDEF Lifestyle. It ships directly from them and it is not Prime eligible. Coupon code CLEAROUT15 gets you 20% off select clearance items at BuyDIG until 12/31/17 at 11:59pm ET. One of those options is the open-box Fostex HP-A4 24-bit DAC/amp which drops from $299 to $240~ with free shipping. There is only one unit available of this per the listing there. Running for the next two days and change (from blog-posting date), Massdrop is offering the new condition DarkVoice 336SE OTL Headphone Amp for $200 plus shipping and handling. This will ship in early February 2018 from Massdrop, and all sales are final. There is no mention to warranty in the listing. During checkout, you have a choice of 110V or 220~240V power supply. The new condition Optoma NuForce uDAC5 goes for $199, but if you purchase it from the official NuForce Amazon store, the price will automatically drop by 10% in the shopping cart, making it a $180~ with free shipping. The shipment is fulfilled by Amazon, so Prime members get the usual free two days. Only the option sold by the NuForce Amazon store gets the automatic in-cart 10% off. This too has a USB audio input and RCA and digital coaxial outputs. It supports up to DSD 256 and averages 3.9 out of 5 based on 7 customer reviews and has five answered questions. It is USB powered, there is no separate power input.